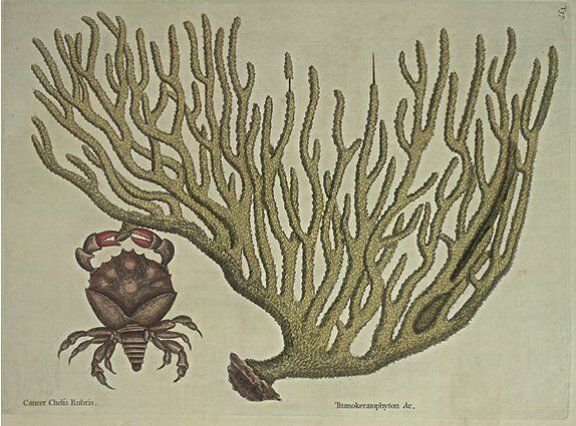 This Crab is commonly of the Size of the Figure, of a brown Colour: It hath two Claws of unequal Bigness, red at the Ends, and eight Legs, which seem of less Use to them than in other Crabs, for when on the Ground they crawl with slow Pace, dragging their Bodies after them, but are mostly seen grasping with their Claws and hanging to some Sea Plant or other marine Substance. This Plant rises from one to two Feet in Height, covered with a very thick tuberculated Incrustation, which while it is growing in the Water, is covered with a thick Slime or Mucilage. The whole Plant is pliant and very ponderous, both which it retains when dry, the Colour of it is deep yellow, as well while it is growing as when dry.